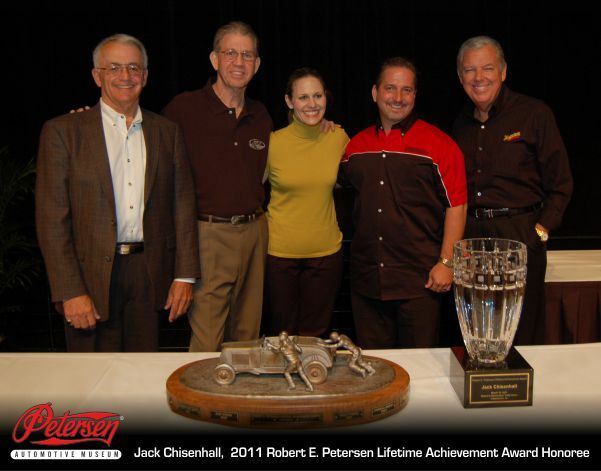 Jack Chisenhall, owner of Vintage Air, was recently awarded the 2011 Robert E. Petersen Lifetime Achievement Award at the 13th Annual Hot Rod & Restoration Trade Show. The Robert E. Petersen Lifetime Achievement Award is awarded to true innovators in the hot rod industry. Jack created the whole aftermarket air conditioning market in the hot rod industry when he founded Vintage Air back in 1976. Jack Chisenhall is a lifelong car buff who created a whole new market sector that has helped make year-round rodding possible. After nearly 35 years in business, Vintage Air, the company he founded in 1976, continues product innovation in high-performance air conditioning components through its full in-house R&D, in-house engineering and manufacturing facilities. Jack was born in 1947 in Fort Worth, Texas. His father was a master sergeant in the Air Force, so the family moved to New Isenberg, Germany, shortly after Jack’s birth. The family was transferred back to the United States in 1954, settling in Schertz, Texas, while Jack’s father was stationed at Randolph Air Force Base. Jack was a car guy from an early age, and grew up reading Hot Rod, Rod & Custom, Car Craft and the other car magazines of the day. Even as a young boy, he told his father that he was going to make hot rod parts for a living when he grew up. While his father spent long hours at work and had other overseas duty, Jack’s mother would take him driving in the country looking for old cars. He bought his first old car, a 1936 Chevy, for $20 when he was 13 years old. Six months later, he sold the coupe for $100 and rescued a 1930 Model A sedan from a local junkyard because it was as close to a Deuce as he could afford. He rebuilt the Model A, eventually installing a Pontiac engine and Corvette rear end. Like most hot rodders, he also spent a considerable amount of time at the drag races once he got his Model A on the road. After graduating from high school, Jack enrolled at Southwest Texas State University and joined the ROTC program. While he was in college, he started his first business, a small hot rod shop that specialized in engine swaps, custom tube headers and all kinds of hot rod fabrication. He graduated in 1970 with a BS in Commercial Art and as a first lieutenant in the Air Force, where he received his pilot’s training. Upon his discharge from the Service, Jack worked for several furniture companies in the design and engineering departments while he nurtured a plan to start his own business. As he had told his father, he was trying to think of something he could build for old cars that would be really innovative. Living in the heat of south Texas, Jack decided he wanted air conditioning for his own hot rod, and saw that aside from adapting some type of factory OEM system, there were no real options. He thought that if he could find a way to air condition his sedan, surely others would be interested as well. Jack started Vintage Air in 1976, initially installing air conditioning systems in late-model vehicles and trucks while he was growing the company. The business continued to grow and expand into several buildings over the next few years. In 2001, the company moved into a new purpose-built 40,000-square-foot manufacturing facility. In addition to developing and manufacturing kits for street rods and muscle cars, Vintage Air also has worked with several OEM companies to satisfy their needs for performance climate control systems. In 1995, Jack ran 241 mph at Bonneville in his 1953 Studebaker with the air conditioning on to demonstrate the reliability and performance of Vintage Air air conditioning systems. Immediately after the event, he changed tires and gears, and drove the Studebaker from Los Angeles to Detroit on the Hot Rod Power Tour. Jack was recognized with a Pioneer Award from the Mobile Air Conditioning Society in 2001 for innovations in the automotive air conditioning industry. Jack was one of the founders of SRMA (Street Rod Manufacturers Association), which later became the HRIA SEMA council. He was instrumental in establishing the original SRMA winter trade conference that became the Hotrod & Restoration Trade Show. Jack is a strong supporter of Goodguys Rod & Custom Association’s Young Guys program, and he sponsors the NSRA 29 Below program. Both programs provide special parking areas at events for younger enthusiasts to gather, meet and mingle with their cars.